This is the tree that we recommend if you are inexperienced with bonsai or you do not have a green thumb. In our opinion, it is one of the easiest bonsai trees to care for and is a very beautiful trouble-free evergreen. If you don't know which tree to purchase as a gift, this is the tree to select. 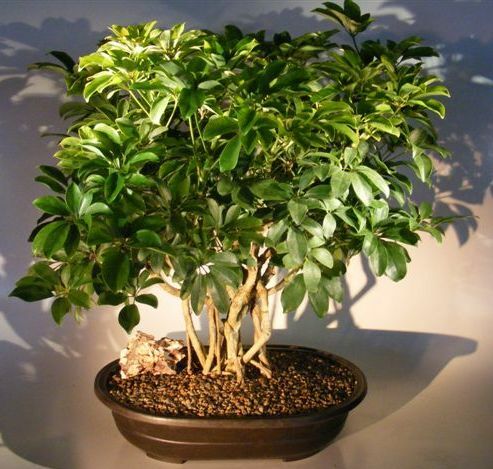 This tree is great for home, office or restaurant and does well in lower or higher lighting conditions. Our tree features tiny umbrella shaped leaves forming a dense green canopy with an enormous braided and banyan root system forming the trunk of the tree. Very popular. Easy indoor care. 30 years old, 26" x 24" x 26" tall. Potted in a 16" oval Mica container. Suitable humidity/drip tray is recommended. To purchase add $19.95.